Monarch Butterfly populations have been declining in recent years. One of the main causes is the loss of habitat, especially habitat with host plants for Monarch Butterfly caterpillars. To help provide habitat, this project proposes creating Monarch Waystations in local parks and conservation areas throughout the St. Louis region. A Monarch Waystation is a specialized butterfly garden providing not only nectar plants, but also concentrations of host plants specifically for Monarchs. - Identify possible locations for Monarch Waystations. - If the location is a public area, obtain permission to create the garden. - Work to obtain the plants and do the actual planting. Once created, members could monitor the Waystations for Monarch Butterflies and caterpillars. Chapter members could raise and release Monarchs in the Waystations at some point in the future. We could also involve children in nearby schools to raise Monarchs for release. 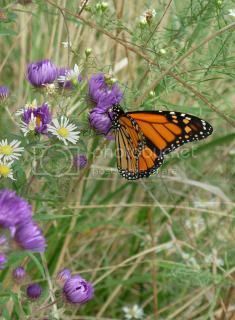 Monarch Butterfly on a New England Aster was taken at Hidden Creek Savanna during the Plant & Pollinator surveys done 09/28/13. Since the Great Rivers Chapter is already partnering with the City of Sunset Hills and the Department of Conservation at the Claire Gempp Davidson Memorial Conservation Area, Sherri Schmidt suggested creating an initial Waystation at Gempp. This project would be considered a part of the overall Gemp project currently being led by Bill Hoss. Sherri thought we could use the Gempp Monarch Waystation project as a model for future Monarch Waystation projects, and apply any lessons learned. In November 2013, Sherri Schmidt and Bill Hoss submitted a proposal outlining the Monarch Waystation project to Gerald Brown, the Sunset Hills Director of Parks and Recreation, because Sunset Hills is leasing and maintaining the property. Gerald presented the proposal to the Commission providing oversight of the Gempp CA. The Commission indicated they would like us to move forward with the project. After comparing sites we selected for Monarch Waystations with sites approved by the Commission, we settled on a southern corner of an existing butterfly garden for the first Waystation. We identified the native host and nectar plants we would like to use in the Waystation. As a next step, we need to calculate the number of plants needed. We will submit the list and number of plants to Gerald in the near future. Gerald will work to obtain the plants for the Waystation. We would like to begin planting in March of 2014. Sherri and Bill will attend the next Commission meeting in early 2014 to discuss the project and answer any questions.